Sri Aurobindo explains that the metaphysical process by which the mind is separated from its origin, the Supermind despite it being controlled by the Supermind from behind is due to Avidya, the self-ignoring faculty. He then explains the psychological mechanism that sustains Avidya, the great and primal Ignorance. This is effectuated by a psychological exclusivity of the individualised soul in a particular space-time matrix. The question then arises that if emotions, feelings, ideas and activities have a commonality, why do human beings consider each to be exclusively separate from others? 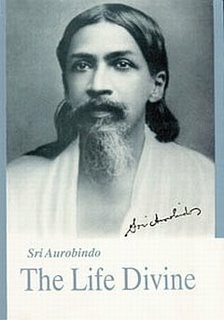 Sri Aurobindo describes that this is due to a unique phenomenon of consciousness. This phenomenon facilitates an exclusive concentration of consciousness to support the individuation of the soul in the cosmic gestalt. It is as if a whirlpool formed in a cosmic ocean signifying an exclusivity of individual consciousness in the matrix of cosmic consciousness. ‘Whence then does the limiting Avidya, the fall of mind from Supermind and the consequent idea of real division originally proceed?...It proceeds from the individualised soul viewing everything from its own standpoint and excluding all others; it proceeds, that is to say, by an exclusive concentration of consciousness, an exclusive self-identification of the soul with a particular temporal and spatial action which is only a part of its own play of being; it starts from the soul’s ignoring the fact that all others are also itself, all other action its own action and all other states of being and consciousness equally its own as well as the action of one particular moment in Time and one particular standing-point in Space and the one particular form it presently occupies’ (The Life Divine, pg 180-181). What is the result of this exclusive concentration? We not only fall prey to Ignorance or Avidya, we also construct wrong ways to understand the world’s phenomena. We fail to appreciate that Truth is not linear but global. Therefore Truth is not successive but simultaneous. In other words, we have ‘thus lost the truth of the indivisibility in Time, the indivisibility of Force and Substance’ (Ibid, pg 181). We have ‘lost sight even of the obvious fact that all minds are one Mind taking many standpoints, all lives one Life developing many currents of activity, all body and form one substance of Force and Consciousness concentrating into many apparent stabilities of force and consciousness; but in truth all these stabilities are really only a constant whorl of movement repeating a form while it modifies it; they are nothing more’ (Ibid). The next pertinent question that arises is how we are befooled to believe that the divisible aspect of Reality is the only truth. This is because actually we are witness to the fact that the external, divisible reality is itself non-sustainable in the long run. Forms disintegrate and seem to perish; death is a harsh but stark truth, life has an optimal span; ideas change and emotions fluctuate in an existence which is in a perpetual flux. Nothing seems to survive but change. This realization of instability of the external world readily leads us to believe in the divisibility of reality as the only truth. Sri Aurobindo describes that the truth of divisibility is phenomenal, but not real. What is real is the essence of the creative seed-idea in the bosom of the Supermind, the “Real-Idea” which is reflected and replicated endlessly. ‘Only the eternal Real-Idea is firm and maintains a certain ordered constancy of figures and relations in the flux of things…these truths Mind has to rediscover; it knows them all the time, but only in the hidden back of consciousness, in the secret light of its self-being; and that light is to it a darkness because it has created the ignorance, because it has lapsed from the dividing into the divided mentality, because it has become involved in its own workings and its own creations’ (Ibid).